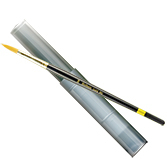 get one (1) #10 Round Gold Holbein Brush AND Brush Case FREE! Limit one per customer per retail purchase. Available at the registers, while supplies last. Get one (1) Liquitex Umbrella FREE! Great for rain but also snow and the bright, hot, hot sun! Get one (1) Liquitex Tumbler FREE! Great for your favorite hot beverage! Get one (1) Liquitex Hand & Nail Brush FREE! Great for scrubbing those Liquitex Acrylic paint splatters! get one (1) 1.25oz Hansa Yellow or Alizarin Crimson M.Graham Oil Paint tube FREE! Limited to stock on hand, selection varies per store. Available at the Denver and Colorado Springs stores only. 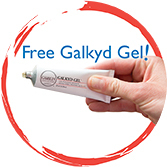 get one (1) Gamblin Galkyd Gel 1.25oz tube FREE! 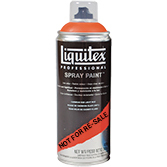 get one (1) Liquitex Spray Paint Can FREE!